…… so last week I said I was going to try knitting socks…… what on earth did I do that for? Ever since I said that, pretty sock patterns keep jumping out at me. First it was Anna Richardson’s Jump ‘n’ Jive socks in Knit Now Issue 21, then Rachel Atkinson’s Beat Feet from Knit Now Issue 20 and Fiona Morris’s Bilberry from The Knitter Issue 56…… and now the latest issue of The Knitter has arrived and there are some pretty leafy green toe-up socks by Jacqui Harding in it! I want to make them all! I’ve bought 2.5mm DPNs and a 2.5mm x 80cm Addi Premium circular needle (I;m not sure whether to try magic loop of DPNs) and now I’m desperate to get started. But which to make first? 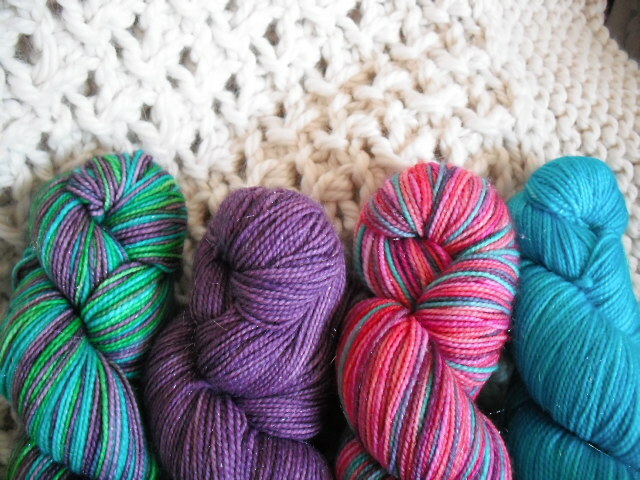 And which yarn to use? 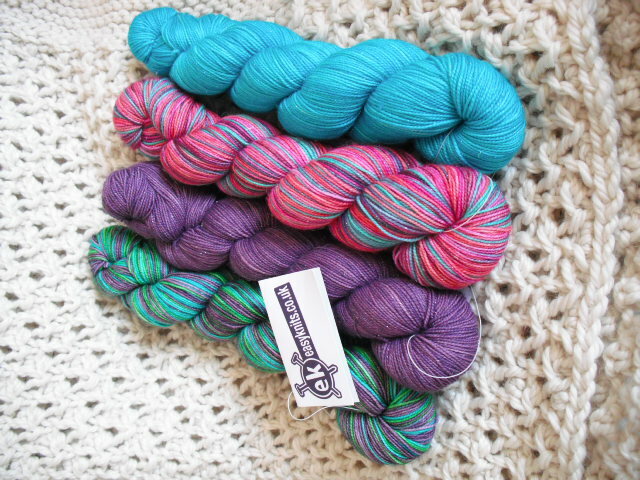 I have some lovely Easyknits Twinkle 4ply which would be perfect to use for socks, but I sort of want to make shawls with it, and those multi coloured skeins would hide the pretty pattern details of all the socks I like. Even if I do use it for socks how would I choose which skein to knit with? Sometimes I am so intolerably indecisive, I even annoy myself. Besides….these photos remind me that I need to finish my cosy bramble stitch throw/blanket/snuggly thingy (just, as someone keeps reminding me, in time for summer – they know who they are)! I’ve knitted a log cabin-ish border along two of the sides and I’m just about to finish the third….. better go and get knitting! Which socks do you think I should make first? Leave a comment and let me know! Yes, I am trying a bit of extreme knitting (I know – this is the sort of things that newspaper articles joke about, as if it doesn’t exist, or is an oxymoron) with some old relics and oddments from my stash (about 15 or so strands and 24mm needles from Rachel John – I’ve only had them 4 years *ahem*). Yes, it is huge….mahoosive in fact! Goodness knows if I will ever finish it – it is already getting very heavy – but I really love the thick squishy fabric so far. 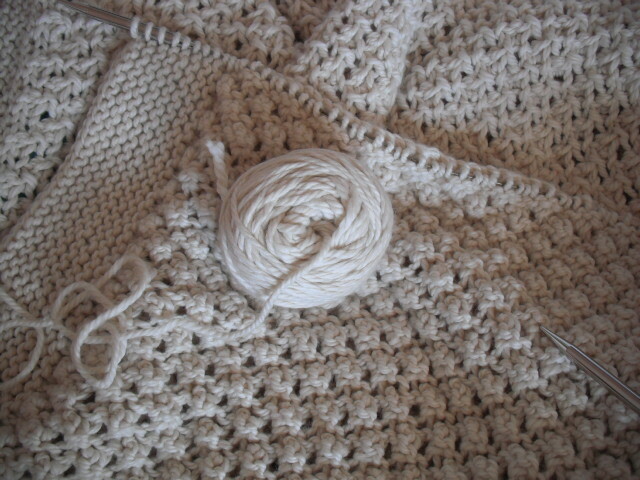 I’m not really sure if it will be a blanket or throw or a rug yet, or even where it will go, but something about the eccentricity of the whole thing appeals to me – non-knitters might think I’ve gone mad, and you know what, I don’t care! I’m even using some ancient Rowan Big Wool Tuft that I bought when I first started knitting and I thought I would never use because it is a bit hideous, but somehow with the scale of this it works! I’m trying to go for a sort of marine look with the colours, and I even have some Louisa Harding Jasmine in there for a bit of silvery sparkle, like light glinting off the sea, as well as some handspun that I bought at a craft fair on holiday in Austria a few years ago. If anyone asks, I’m calling it ART!